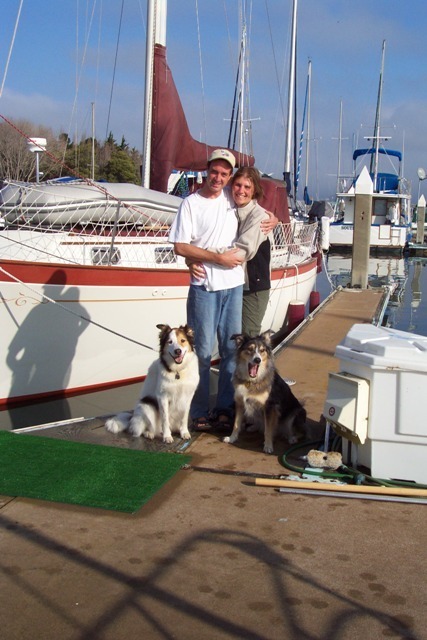 Mark and I once owned a 36 foot monohull sailboat, back in California, back in 2005. 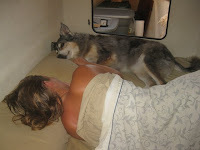 The plan was to fix her up and set sail for Mexico with our dogs Kali and Darwin. After many months of hard work and a few short trips in San Francisco Bay, the four of us set off… only to put the boat up for sale three days later. Why? Our precious dogs did not like the heeling of the boat. They were restless, uncomfortable and unhappy. And, when they were miserable, we were as well. We continued our adventure overland (all the way to Panama) and everybody was happy again. Our next boat had to be a catamaran and even though none of us - humans or dogs - had set foot on one before, it was the right choice for all of us to live and sail indefinitely. Darwin and Kali liked to be on Irie. We installed life netting and had an easy time loading the dogs on and off the boat. They were comfortable at anchor and underway and with their two or three daily shore visits, things could be worse. First, Kali passed away in Puerto Rico, being 10.5 years old. Darwin followed her less than two years later and all of a sudden Irie was dog-less. 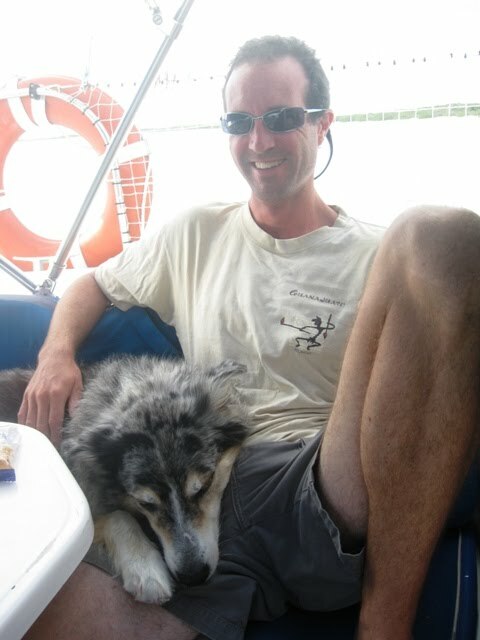 Mark and I had not lived on a boat without dogs, so the adjustment was huge and sad. When a loved one passes away, you think you will never function or be happy again and you simply can not imagine living without him or her. Nothing seems to be worth it anymore. It is incredibly painful. But, life goes on and the pain decreases, very very very slowly. Our memories stay alive with pictures, movies, conversations and daily thoughts of Darwin. We still lit a candle once in a while and can’t get used to his absence. We miss him enormously, even after three months have gone by. When we first went ashore in St. Maarten or saw old cruising friends again, everybody felt sorry about our loss and sad about not having Darwin around anymore. It took me a month to write a poem about “my boy” and another one to be able to read it out loud at an Open Mic session in Lagoonies. It was published in the February 2011 issue of Caribbean Compass (page 30, http://issuu.com/caribbean-compass/docs/compass_online_february11/31?mode=embed ). 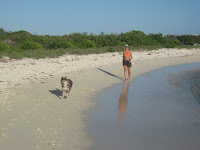 Each time Mark and I see dogs ashore we need our fix and pet, cuddle and love the fortunate four-footers. When we’re lucky, we get loaded with kisses or whacked by happy tails. On Irie, the routine has changed. We used to start the day with a dog walk on the beach, break up the early afternoon with another trip ashore and finish a day’s work with a relaxing and mind clearing stroll on the beach again. Friendly encounters spontaneously took place because of Darwin’s presence, drawing attention to his good manners, pretty face or soft fur. Now, the dinghy stays up, sometimes even for days at a time. Nobody stands guard when boats pass by, nobody warns us when somebody approaches, nobody greets our visitors with a friendly bark, and nobody is anxiously waiting and anticipating our return with a welcoming expression and wagging tail.